Whitetail deer are beautiful creatures. I say this even though I spend inordinate amounts of time keeping them from devouring my flower gardens in the summer and the seed in the birdfeeders in the winter. 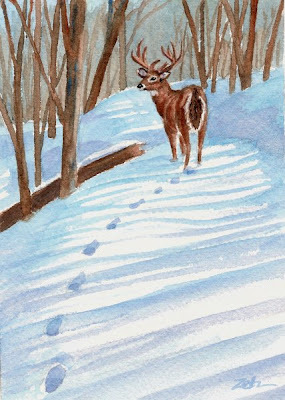 When I happened upon a buck with full-grown antlers one November, the snow already on the ground, I just stood there entranced holding my breath. I guess he did too. He was still as a statue. We watched each other silently for what seemed a long time (I'm no hunter and am happy just to observe!). He finally moved first. With a flip of his tail and a bound, he was up the hill and out of sight.